What we call book today may have different meanings. A book is a number of paper sheets bound together, with a paper or hard cover. A book is an Audio CD with a person or several persons telling a story. A book is a file in one of the suitable formats for computers and various devices. All of them are books and can be organized with Booknizer. A person who loves reading may have any combination of paper books, electronic books and audio books in his or her home library. Sometimes, there is a paper copy and electronic version of the same book. Sometimes, an e-book is supplemented by its audio book version. One can also have several paper copies of the same book published in different years, an abridged and the full version, etc. Now, how do we add all of those into Booknizer? Some users try adding the same book several times and wonder why this does not work. The answer is simple: for this kind of situation, Booknizer offers Editions. If you already have a book in your database and want to add a new edition / version of it, double click the page of the book, or click "Edit info" on the toolbar. This opens the "Add/update book" window that has several tabs. Open the "Editions" tab. Here you can add new editions using the green plus button or remove existing one with the yellow minus, change their order, enter details such as cover / format, book #, location, etc. If you are adding a new e-book edition, select the e-book file using the "Open file" dialog or enter its path directly and click "Reload" to load information about the file. Audio book files can be added on the "Audio book files" tab in the lower part of the window. 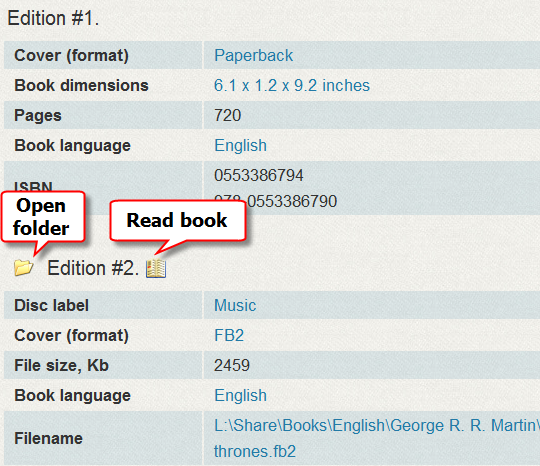 You can open and read e-books directly from the program (the corresponding book format must be associated with a third-party reader program). 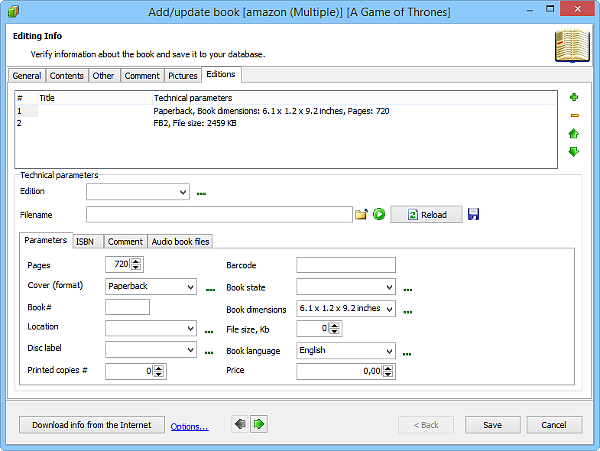 Audio books can be played using the built-in or an external player. Some further information about editions is available on this page.